While these performance failures call into question the MEGA board's ability to make projections about the job potential at specific companies, it does not in itself show that MEGA is failing to stimulate the economy. As mentioned above, when MEGA officials approve a MEGA tax credit package, they hope not only to create jobs at the plant that receives a MEGA deal (called "direct" jobs), but also to generate "spin-off" or "indirect" jobs. These jobs might be created at other Michigan businesses — such as a major supplier — that sell items to the plant, or at local businesses — perhaps nearby restaurants and retail stores — that sell items to the plant's workers. In addition, such "spin-off" jobs might be created at Michigan distributors or retailers that buy and resell the plant's products. Hence, to determine whether MEGA has had a significant positive impact, it's necessary to perform a more complex analysis of Michigan's economy. Such an analysis would attempt to isolate MEGA's potential impact and separate it from other factors that may be driving the state's economy, such as general trends in the national economy. In 2005, such an analysis was performed by Michael LaFaive (one of the authors of this study) and Michael D. Hicks, then a research professor at the Center for Business and Economic Research at Marshall University and now director of the Bureau of Business Research at Ball State University. 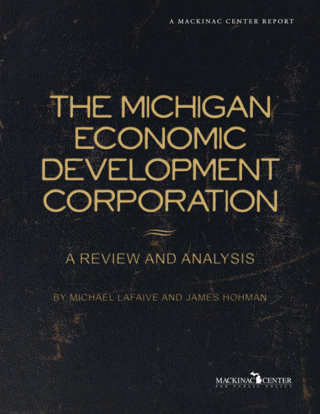 The analysis, which was recently accepted for publication in the academic journal Economic Development Quarterly, involved a peer-reviewed statistical study of the MEGA tax credits awarded in each Michigan county and extensive county-level data in Michigan from 1990, five years before MEGA's inception, to 2002, the most recent data available at the time. By including pre-MEGA data, the analysis helped ensure that MEGA's impact post-1995 could be better discerned from existing county-level economic trends. The resulting model allowed an examination of state and county per-capita personal income, employment and unemployment rates. [*] As we note below, the same cannot be said of the other business incentives that MEGA arranges when it arranges a MEGA agreement. Other state and local subsidies that are part of a MEGA deal are often awarded to the company right away, prior to a company's job creation or investment . Nathan Bomey, "Expiring Tax Credits Threaten Ann Arbor's Economic Development Strategy, Officials Say," AnnArbor.com, August 16, 2009. LaFaive and Hicks, "MEGA: A Retrospective Assessment," 4.